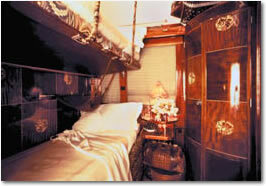 Step aboard the Venice Simplon-Orient-Express and you step back into a more gracious, elegant age. Your personal steward, instantly available to attend your every comfort, will show you to your compartment of gleaming wood, polished brass, soft towels and crisp linen. Your comfortable compartment is a restful retreat offering panoramic views of ever changing landscapes. Your meals on board will be unforgettable. Set the tone with a visit to the Bar Car, famous for its delicious cocktails and welcoming atmosphere. Then on to one of our three dining cars, softly muted lighting enhances the mood while fine linen, French silverware and heavy crystal invite you to prepare for a meal to remember. 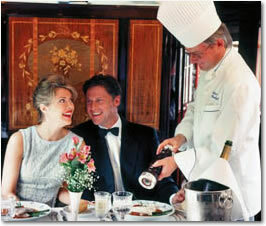 Meals on board the Venice Simplon-Orient-Express are an unforgettable delight. All dishes are freshly prepared onboard by French chefs, with the finest supplies taken onboard during the train's journey. 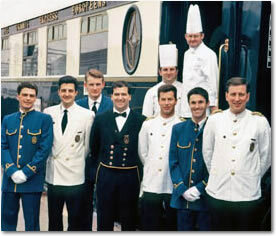 Lunch, dinner and brunch is served by the Italian waiters in one of the three individually styled Restaurant Cars: Lalique, Etoile du Nord or Chinoise. 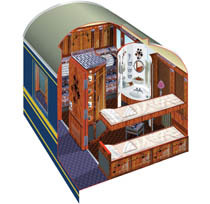 Breakfast and afternoon tea are served in passengers' compartments. Table d'hôte meals are included in the fare, while an á la carte menu and 24-hour compartment service is available additionally. The Maitre D' will come to your cabin to take your lunch and dinner reservations. Roast duck supreme, white truffle flavoured "foie gras"
Travelling in private compartments, passengers are attended by Cabin Stewards throughout the journey, and are assured of attentive yet discreet service. Each compartment has its own original washbasin cabinet with hot and cold water, and at night-time becomes a comfortable bedroom, complete with soft towels and crisp linen. 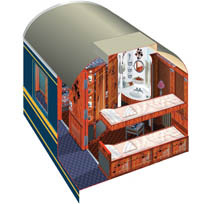 Passengers may select from two types of compartment: Double and Single. Cabins convert in moments from daytime seating to a comfortable bedroom. Combining two interconnecting cabins to create a private lounge with a banquette sofa, footstool and small table and a sleeping compartment with an upper and lower bed. A washbasin with hot and cold water is enclosed in a cabinet and towels and toiletries are provided. Facilities include 24-hour steward service called by a bell, international electric sockets (230 volts) and 115 volt socket for razors, individually controlled radiators supply heating. Some compartments are fitted with a personal safe. Overhead luggage racks are provided for the storage of a limited amount of luggage and two coat hooks and two hangers for hanging up clothes in each of the compartments. A private lounge during the day with a banquette sofa, footstool and small table converts to night configuration with an upper and lower bed. A washbasin with hot and cold water is enclosed in a cabinet and towels and toiletries are provided. Facilities include 24-hour steward service called by a bell, international electric sockets (230 volts) and 115 volt socket for razors, individually controlled radiators supply heating. Some compartments are fitted with a personal safe. Overhead luggage racks are provided for the storage of a limited amount of luggage and two coat hooks and two hangers for hanging up clothes. 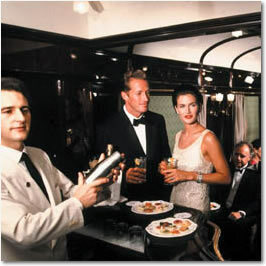 Famous for its delicious cocktails and welcoming atmosphere the Bar Car is the heart of the train. It is truly a unique, intimate and stylish experience that resounds to the voices of royalty, heads of state and celebrities such as Gregory Peck, Alan Whicker and Cher. Transformed and designed by Gerard Gallet from a dining car, the bar car is the ideal rendezvous to enjoy relaxed conversation and warm to the skills of our resident pianist. Dressing for the occasion is all part of the experience. 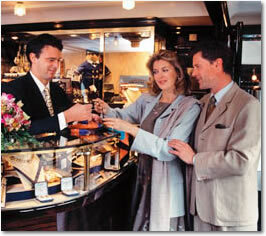 Our guide is that you can never be overdressed aboard the Venice Simplon-Orient-Express. But whilst you relax in the Bar Car ponder this question – which came first, the baby grand piano, or the carriage that surrounds it? Our intimate onboard boutique is located at the rear of the Lalique car. What better way to remember this memorable journey, than to enjoy a gift from The Collection Venice Simplon-Orient-Express? These train inspired home accessories include our original art nouveau brass table lamp and hand blown French crystal. Plus, classically fashioned ladies' and gentlemens' accessories in luxury pure silk, cashmere and velvet. So whether you are choosing something for yourself, or selecting a gift for a friend, it will forever remain a beautiful memento of your journey. 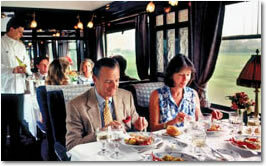 Your steward on the British Pullman train will serve your meals and any other drinks or refreshments you may require. The steward responsible for your carriage on the VSOE will be available at all times and may be called by the bell in your cabin. He will take care of your passport during the journey, change your cabin from day to night configuration, serve breakfast and other refreshments in your cabin as required. The Train Manager will be on hand throughout the journey. He is there to help should you have any queries while on board. If you should wish to speak to him, please tell your steward who will contact him on your behalf.